5.0 de 5 estrellasGreat film discusses health and the truth behind nutrition. Very informative. It provided my husband with all the logical and scientific answers he needed in order to change his dietary habits. I do not eat any animal products and started this because of the ways in which animals are treated, however I noticed a change in how I was feeling. I could not explain it to my husband in the detailed, specific way he was needing in order to understand, but this movie did it for him. And it made me more confident in my decision to become a vegan. We really enjoyed how the documentary showed individuals from different socioeconomic classes practicing a plant-based, animal-free diet and the effects it had on their health and life. This proved that this lifestyle is possible for anyone to adopt. If you have not made the decision to reduce the amount of animal product in your diet, do not let that discourage you from watching this film. There is plenty of useful information mentioned that applies to meat-eaters, vegans and all in between. Be open minded and take what you will from this documentary. Hopefully you will be inspired like my family was. PS: There is not a lot of footage about animal cruelty in this documentary. As I mentioned, the reason I first became a vegan was due to animal rights, but I am not the type of person who can sit and watch a video that show graphic images. I know what happens, I don't ignore it, but I cannot comfortably sit and watch it. So for those of you like me, rest assured you'll be able to get through this documentary. A 114 personas les resultó útil. Information worth ten stars. If you watch only one documentary on nutrition, human health, and longevity, this is the one to choose. It will open your eyes, change your mind, and probably save your life. The Forks Over Knives principles are scientifically proven. No fads, gimmicks, or twisted statistics. You're never too old to improve your health. Don't wait a minute longer! I buy a package of four DVDs every couple of years because borrowers want to keep them and fail to return them. So far, I have loaned this movie to 43 people, and one-third have changed their dietary habits in order to avoid all of the most prevalent chronic diseases in contemporary Western cultures. 5.0 de 5 estrellasThe healthiest way to live! Since quitting smoking 6 months ago I have put on 35-40lbs and have discovered lots of congestion and allergies. I would tell others than when I was drinking milk, eating cheese or any dairy or meat I felt horrendous and very congested. 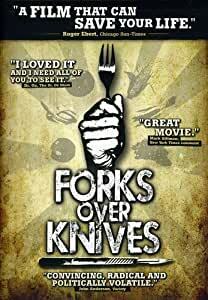 I kept talking with others who would say "have you watched Forks over Knives" or "have you thought about going to a plant based diet" I finally watched the movie tonight and before I did so I went and bought the companion book. I am on board to start this tomorrow. I just heard of a friend who died a couple of days ago. His diet was horrendous with lots of meat, sugar and dairy. As he was only about 8 years older than me and I'm going to be 57 next week, it's time to switch my diet. This was a great movie that gave me tons of wonderful information. It also made me think about how we treat animals, although the movie did not focus on that aspect. It's crazy how much money and lives could be saved by changing our diet and cutting out those unnecessary foods talked about in this movie. I wonder if in 100 years when someone looks back on this movie they will wonder what took us so long to discover a healthy way to live. 5.0 de 5 estrellasI keep buying these and loaning them out, then having to buy another... You CAN really improve your health. I've bought several copies for friends. The response is mixed. Many believe that wheat and soy are bad and meat is the only thing to eat - until they get diabetes, cancer, and other diet related health problems and come looking for something to change to fix the problem - I lost a close friend & mentor to stomach cancer a few years ago. I am continuing to reduce my weight, have lowered my cholesterol significantly to healthy levels, and have returned to perfect glucose levels (92-100 fasting) mostly following the diet outlined in the video, and my multiple doctors all tell me I'm better off, now that I'm following this lifestyle (diet AND EXERCISE). If you don't believe vegetarian/vegan diet, you'll be able to make enough excuses to continue with your current meat/dairy diet and lifestyle and not notice any problems for years, but around age 40-45, it will begin to catch up, and I hope you will remember the messages this video presents and reconsider. Better to avoid creating the problems, but if not, it's never too late to change for the better, and the diet proposed in this video is a good start. A 28 personas les resultó útil. Excellent! Everybody needs to watch this one. It's well done research by three doctors who did simultaneous, almost identical research, on the same subject, not knowing the others were doing it, and all got the same results. It's about preventing cancer by how much animal protein we cosume.